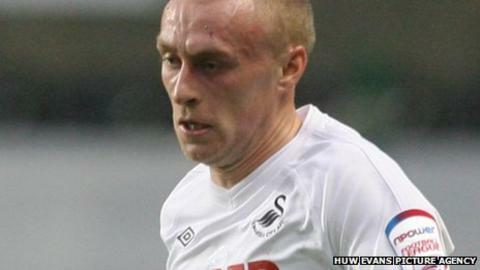 Swansea City have cancelled the contract of Wales winger David Cotterill by mutual consent. Cotterill joined the Swans in January 2010 from Sheffield United for a then club record fee of £600,000 after a loan spell at the Liberty Stadium. The 24-year-old made 21 appearances in his first season but played just 16 times last season and also went on loan to Portsmouth. Cotterill, who has won 19 caps, has not appeared for the Swans this season. The Cardiff-born player began his career as a trainee with Bristol City before he moved to Wigan Athletic for a fee of £2m in August 2006. He made just 18 Premier League appearances in 18 months for the Latics before joining Sheffield United in July 2008 after a loan spell at Bramall Lane.